Arginine, also known as L-arginine (symbol Arg or R), is an α-amino acid that is used in the biosynthesis of proteins. It contains an α-amino group, an α-carboxylic acid group, and a side chain consisting of a 3-carbon aliphatic straight chain ending in a guanidino group. At physiological pH, the carboxylic acid is deprotonated (−COO−), the amino group is protonated (−NH3+), and the guanidino group is also protonated to give the guanidinium form (-C-(NH2)2+), making arginine a charged, aliphatic amino acid. It is the precursor for the biosynthesis of nitric oxide. It is encoded by the codons CGU, CGC, CGA, CGG, AGA, and AGG. In humans, arginine is classified as a semiessential or conditionally essential amino acid, depending on the developmental stage and health status of the individual. Preterm infants are unable to synthesize or create arginine internally, making the amino acid nutritionally essential for them. Most healthy people do not need to supplement with arginine because it is a component of all protein-containing foods and can be synthesized in the body from glutamine via citrulline. Arginine was first isolated in 1886 from lupin and pumpkin seedlings by the German chemist Ernst Schulze and his assistant Ernst Steiger. In 1897, Ernst Schulze and Ernst Winterstein (1865–1949) determined the structure of arginine. Schulze and Winterstein synthesized arginine from ornithine and cyanamide in 1899, but some doubts about arginine's structure lingered until Sørensen's synthesis of 1910. Arginine is a conditionally essential amino acid in humans and rodents, as it may be required depending on the health status or lifecycle of the individual. For example, while healthy adults can supply their own requirement for arginine, immature and rapidly growing individuals require arginine in their diet, and it is also essential under physiological stress, for example during recovery from burns, injury, and sepsis, or when the small intestine and kidneys, which are the major sites of arginine biosynthesis, have been damaged. It is, however, an essential amino acid for birds, as they do not have a urea cycle. For some carnivores, for example cats, dogs and ferrets, arginine is essential, because after a meal, their highly efficient protein catabolism produces large quantities of ammonia which need to be processed through the urea cycle, and if not enough arginine is present, the resulting ammonia toxicity can be lethal. This is not a problem in practice, because meat contains sufficient arginine to avoid this situation. Animal sources of arginine include meat, dairy products, and eggs, and plant sources include seeds of all types, for example grains, beans, and nuts. Arginine is synthesized from citrulline in arginine and proline metabolism by the sequential action of the cytosolic enzymes argininosuccinate synthetase and argininosuccinate lyase. This is an energetically costly process, because for each molecule of argininosuccinate that is synthesized, one molecule of adenosine triphosphate (ATP) is hydrolyzed to adenosine monophosphate (AMP), consuming two ATP equivalents. The pathways linking arginine, glutamine, and proline are bidirectional. Thus, the net use or production of these amino acids is highly dependent on cell type and developmental stage. On a whole-body basis, synthesis of arginine occurs principally via the intestinal–renal axis: the epithelial cells of the small intestine produce citrulline, primarily from glutamine and glutamate, which is carried in the bloodstream to the proximal tubule cells of the kidney, which extract citrulline from the circulation and convert it to arginine, which is returned to the circulation. This means that impaired small bowel or renal function can reduce arginine synthesis, increasing the dietary requirement. Synthesis of arginine from citrulline also occurs at a low level in many other cells, and cellular capacity for arginine synthesis can be markedly increased under circumstances that increase the production of inducible NOS. This allows citrulline, a byproduct of the NOS-catalyzed production of nitric oxide, to be recycled to arginine in a pathway known as the citrulline-NO or arginine-citrulline pathway. This is demonstrated by the fact that, in many cell types, NO synthesis can be supported to some extent by citrulline, and not just by arginine. This recycling is not quantitative, however, because citrulline accumulates in NO-producing cells along with nitrate and nitrite, the stable end-products of NO breakdown. Arginine plays an important role in cell division, wound healing, removing ammonia from the body, immune function, and the release of hormones. It is a precursor for the synthesis of nitric oxide (NO), making it important in the regulation of blood pressure. Arginine's side chain is amphipathic, because at physiological pH it contains a positively charged guanidinium group, which is highly polar, at the end of a hydrophobic aliphatic hydrocarbon chain. Because globular proteins have hydrophobic interiors and hydrophilic surfaces, arginine is typically found on the outside of the protein, where the hydrophilic head group can interact with the polar environment, for example taking part in hydrogen bonding and salt bridges. For this reason, it is frequently found at the interface between two proteins. The aliphatic part of the side chain sometimes remains below the surface of the protein. Arginine is the immediate precursor of NO, an important signaling molecule which can act as a second messenger, as well as an intercellular messenger which regulates vasodilation, and also has functions in the immune system's reaction to infection. Arginine is also a precursor for urea, ornithine, and agmatine; is necessary for the synthesis of creatine; and can also be used for the synthesis of polyamines (mainly through ornithine and to a lesser degree through agmatine, citrulline, and glutamate.) The presence of asymmetric dimethylarginine (ADMA), a close relative, inhibits the nitric oxide reaction; therefore, ADMA is considered a marker for vascular disease, just as L-arginine is considered a sign of a healthy endothelium. L-arginine is generally recognized as safe (GRAS-status) at intakes of up to 20 grams per day. 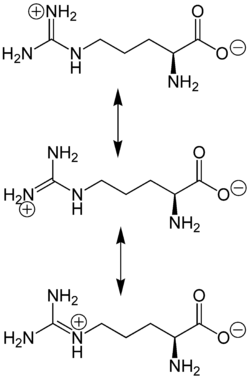 The amino acid side-chain of arginine consists of a 3-carbon aliphatic straight chain, the distal end of which is capped by a guanidinium group, which has a pKa of 12.48, and is therefore always protonated and positively charged at physiological pH. Because of the conjugation between the double bond and the nitrogen lone pairs, the positive charge is delocalized, enabling the formation of multiple hydrogen bonds. Intravenously administered arginine is used in growth hormone stimulation tests because it stimulates the secretion of growth hormone. A review of clinical trials concluded that oral arginine increases growth hormone, but decreases growth hormone secretion, which is normally associated with exercising. However, a more recent trial reported that although oral arginine increased plasma levels of L-arginine it did not cause an increase in growth hormone. A meta-analysis showed that L-arginine reduces blood pressure with pooled estimates of 5.4 mmHg for systolic blood pressure and 2.7 mmHg for diastolic blood pressure. Supplementation with L-arginine reduces diastolic blood pressure and lengthens pregnancy for women with gestational hypertension, including women with high blood pressure as part of pre-eclampsia. It did not lower systolic blood pressure or improve weight at birth. Canavanine and canaline are toxic analogs of arginine and ornithine. ^ IUPAC-IUBMB Joint Commission on Biochemical Nomenclature. "Nomenclature and Symbolism for Amino Acids and Peptides". Recommendations on Organic & Biochemical Nomenclature, Symbols & Terminology etc. Archived from the original on 29 May 2007. Retrieved 2007-05-17. ^ Glasel JA, Deutscher MP (1995-11-20). Introduction to Biophysical Methods for Protein and Nucleic Acid Research. Academic Press. p. 456. ISBN 978-0-08-053498-5. ^ a b Tapiero H, Mathé G, Couvreur P, Tew KD (November 2002). "L-Arginine". (review). Biomedicine & Pharmacotherapy. 56 (9): 439–445. doi:10.1016/s0753-3322(02)00284-6. ^ Wu G, Jaeger LA, Bazer FW, Rhoads JM (August 2004). "Arginine deficiency in preterm infants: biochemical mechanisms and nutritional implications". (review). The Journal of Nutritional Biochemistry. 15 (8): 442–51. doi:10.1016/j.jnutbio.2003.11.010. PMID 15302078. ^ "Drugs and Supplements Arginine". Retrieved 15 January 2015. ^ Skipper, Annalynn (1998). Dietitian's Handbook of Enteral and Parenteral Nutrition. Jones & Bartlett Learning. p. 76. ISBN 978-0-8342-0920-6. ^ Apel F (July 2015). "Biographie von Ernst Schulze" (PDF). Retrieved 2017-11-06. ^ Schulze E, Steiger E (1887). "Ueber das Arginin" [On arginine]. Zeitschrift für Physiologische Chemie. 11 (1–2): 43–65. ^ Schulze E, Winterstein E (September 1897). "Ueber ein Spaltungs-product des Arginins" [On a cleavage product of arginine]. Berichte der Deutschen Chemischen Gesellschaft (in German). 30 (3): 2879–2882. doi:10.1002/cber.18970300389. The structure for arginine is presented on p. 2882. ^ Schulze E, Winterstein E (October 1899). "Ueber die Constitution des Arginins" [On the constitution of arginine]. Berichte der Deutschen Chemischen Gesellschaft (in German). 32 (3): 3191–3194. doi:10.1002/cber.18990320385. ^ Cohen JB (1919). Organic Chemistry for Advanced Students, Part 3 (2nd ed.). New York, New York, USA: Longmans, Green & Co. p. 140. ^ Sölrensen SP (January 1910). "Über die Synthese des dl-Arginins (α-Amino-δ-guanido-n-valeriansäure) und der isomeren α-Guanido-δ-amino-n-valeriansäure" [On the synthesis of racemic arginine (α-amino-δ-guanido-n-valeric acid) and of the isomeric α-guanido-δ-amino-n-valeric acid]. Berichte der Deutschen Chemischen Gesellschaft (in German). 43 (1): 643–651. doi:10.1002/cber.191004301109. ^ a b c Ignarro LJ (2000-09-13). Nitric Oxide: Biology and Pathobiology. Academic Press. p. 189. ISBN 978-0-08-052503-7. ^ a b Borlase BC (1994). Enteral Nutrition. Jones & Bartlett Learning. p. 48. ISBN 978-0-412-98471-6. ^ Freedland RA, Briggs S (2012-12-06). A Biochemical Approach to Nutrition. Springer Science & Business Media. p. 45. ISBN 9789400957329. ^ Nutrient Requirements of Dogs. National Academies Press. 1985. p. 65. ISBN 978-0-309-03496-8. ^ a b Wortinger A, Burns K (2015-06-11). Nutrition and Disease Management for Veterinary Technicians and Nurses. John Wiley & Sons. p. 232. ISBN 978-1-118-81108-5. ^ Spano MA, Kruskall LJ, Thomas DT (2017-08-30). Nutrition for Sport, Exercise, and Health. Human Kinetics. p. 240. ISBN 978-1-4504-1487-6. ^ a b Watson RR, Zibadi S (2012-11-28). Bioactive Dietary Factors and Plant Extracts in Dermatology. Springer Science & Business Media. p. 75. ISBN 978-1-62703-167-7. ^ Morris SM (October 2004). "Enzymes of arginine metabolism". (review). The Journal of Nutrition. 134 (10 Suppl): 2743S–2747S, discussion 2765S–2767S. doi:10.1093/jn/134.10.2743S. PMID 15465778. ^ Mauro C, Frezza C (2015-07-13). The Metabolic Challenges of Immune Cells in Health and Disease. Frontiers Media SA. p. 17. ISBN 9782889196227. ^ Stechmiller JK, Childress B, Cowan L (February 2005). "Arginine supplementation and wound healing". (review). Nutrition in Clinical Practice. 20 (1): 52–61. doi:10.1177/011542650502000152. PMID 16207646. ^ Witte MB, Barbul A (2003). "Arginine physiology and its implication for wound healing". (review). Wound Repair and Regeneration. 11 (6): 419–23. doi:10.1046/j.1524-475X.2003.11605.x. PMID 14617280. ^ Andrew PJ, Mayer B (August 1999). "Enzymatic function of nitric oxide synthases". (review). Cardiovascular Research. 43 (3): 521–31. doi:10.1016/S0008-6363(99)00115-7. PMID 10690324. ^ Gokce N (October 2004). "L-arginine and hypertension". The Journal of Nutrition. 134 (10 Suppl): 2807S–2811S, discussion 2818S–2819S. doi:10.1093/jn/134.10.2807S. PMID 15465790. ^ Rajapakse NW, De Miguel C, Das S, Mattson DL (December 2008). "Exogenous L-arginine ameliorates angiotensin II-induced hypertension and renal damage in rats". (primary). Hypertension. 52 (6): 1084–90. doi:10.1161/HYPERTENSIONAHA.108.114298. PMC 2680209. PMID 18981330. ^ a b Dong JY, Qin LQ, Zhang Z, Zhao Y, Wang J, Arigoni F, Zhang W (December 2011). "Effect of oral L-arginine supplementation on blood pressure: a meta-analysis of randomized, double-blind, placebo-controlled trials". review. American Heart Journal. 162 (6): 959–65. doi:10.1016/j.ahj.2011.09.012. PMID 22137067. ^ Mathews CK, Van Holde KE, Ahern KG (2000). Biochemistry (3rd ed.). San Francisco, Calif.: Benjamin Cummings. p. 180. ISBN 978-0805330663. OCLC 42290721. ^ a b Barnes MR (2007-04-16). Bioinformatics for Geneticists: A Bioinformatics Primer for the Analysis of Genetic Data. John Wiley & Sons. p. 326. ISBN 9780470026199. ^ Kleanthous C (2000). Protein-protein Recognition. Oxford University Press. p. 13. ISBN 9780199637607. ^ a b Griffiths JR, Unwin RD (2016-10-12). Analysis of Protein Post-Translational Modifications by Mass Spectrometry. John Wiley & Sons. ISBN 9781119250883. ^ Shao A, Hathcock JN (April 2008). "Risk assessment for the amino acids taurine, L-glutamine and L-arginine". Regulatory Toxicology and Pharmacology. 50 (3): 376–99. doi:10.1016/j.yrtph.2008.01.004. PMID 18325648. ^ Alba-Roth J, Müller OA, Schopohl J, von Werder K (December 1988). "Arginine stimulates growth hormone secretion by suppressing endogenous somatostatin secretion". The Journal of Clinical Endocrinology and Metabolism. 67 (6): 1186–9. doi:10.1210/jcem-67-6-1186. PMID 2903866. ^ Kanaley JA (January 2008). "Growth hormone, arginine and exercise". Current Opinion in Clinical Nutrition and Metabolic Care. 11 (1): 50–4. doi:10.1097/MCO.0b013e3282f2b0ad. PMID 18090659. ^ Forbes SC, Bell GJ (June 2011). "The acute effects of a low and high dose of oral L-arginine supplementation in young active males at rest". Applied Physiology, Nutrition, and Metabolism = Physiologie Appliquee, Nutrition et Metabolisme. 36 (3): 405–11. doi:10.1139/h11-035. PMID 21574873. ^ Gui S, Jia J, Niu X, Bai Y, Zou H, Deng J, Zhou R (March 2014). "Arginine supplementation for improving maternal and neonatal outcomes in hypertensive disorder of pregnancy: a systematic review". (review). Journal of the Renin-Angiotensin-Aldosterone System. 15 (1): 88–96. doi:10.1177/1470320313475910. PMID 23435582. Wikimedia Commons has media related to Arginine.